We meet Ann Twigg, who worked at Lydgate Infant School and is now a children’s author. Ann is one of four sisters and was born and brought up in Sheffield, England. 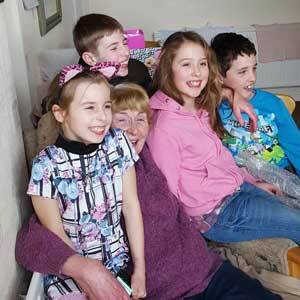 She has three children, eight grand-children and two great-grand-children. She started out as a Sunday school teacher in her early years, before progressing on to work with university-aged students and then in later years went on to work as a dinner lady in Crosspool. How long did you work at Lydgate Lane Infant School and what are your memories of your time there? I worked as a lunchtime supervisor for eight years at Lydgate Infant School and loved every minute until I retired last year. I have some lovely memories of working with the little children and telling them my stories in the playground before they went in for their lunch. There was never a dull moment and I got so much enjoyment from seeing the look on their faces as they listened so intently to whichever story I was telling them. Also I have great admiration for all the teachers and staff who all have so much patience with the children and do their very best to make this school such a lovely friendly and happy place for the children to be. Do you live local to Crosspool? What do you like about it? I was brought up in Crookes and lived there until 1982 when I moved to Crosspool. I have lived in Crosspool ever since. I like Crosspool because it is on the edge of the countryside and we have some fabulous walks around us. What is your inspiration for your stories? My inspiration for some of the stories I wrote came from my grandchildren. I wrote the Red Man and Green Man stories when my little grandson who was about three years old, was waiting with me to cross the road and quite innocently asked me if Red Man and Green Man ever came out of the traffic lights to play. Another story Tom on Robot Island was written for my other grandson Tom who was about seven years old, when he asked me to tell him a story about a robot. Also the idea for the Grumpy Grandad stories was because I actually live with a Grumpy Grandad and the mole really did dig up our garden which he still grumbles about today. I’m sure most of the local children will know the rock on the Bolehills that looks like a ship. I have lived locally all my life and have stood on that rock many times as a little girl pretending it was a ship that sailed away in the dead of night. Hence the idea for the story Alex and the little people. All the other stories are ones I made up for my eight grandchildren and whose names are all in the stories. Why did you decide to set up Playtime Books? I hadn’t really thought about having the stories published as I just liked writing stories for my grandchildren. I had done such a lot though that my son came up with the idea that we ought to publish them on the internet under Playtime Books. He had CDs made and illustrations for the discs at first. What formats do you publish your stories in and how can people get hold of them? We have moved on quite a bit now and the stories are available on CD, book, Kindle, and ACX downloads from Amazon under Playtime Books or Ann Twigg. If you would like to purchase any of the books in CD format then please email joannelouisegraham@outlook.com. Also Grumpy Grandad can be followed on Facebook, YouTube, my website which is www.playtime-books.com and also @ann_twigg on Twitter. This entry was posted in arts, crosspool, crosspool characters, for sale and tagged ann twigg, books, grumpy grandpa, lydgae infant school. Bookmark the permalink.